Carlos Castañeda finished his Percussion Studies at Conservatorio Superior de Música de Canarias, sede de Tenerife, in September 2011. 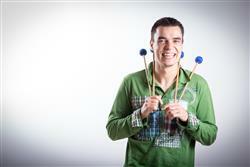 Since 2006 plays as extra percussionist with Tenerife Symphony Orchestra, and Philharmonic Orchestra of Gran Canaria. Founder member of Tak Nara Percussion Group, profesional percussion Duo from Tenerife. Since 2008, have done concerts around Spain, Belgium, Germany, Slovenia, Serbia, Italy and EEUU, with presentation at PASIC 2013 with Nebojsa Jovan Zivkovic, and also recorded one CD, “Tak-Nara”. Since 2013, is percussion teacher at Professional Conservatory of Tenerife. At this time, is endorser artist with Adams Instruments, Innovative Percussion and Southern Percussion.